Absorption cooling operates similarly to conventional electric vapor compression chillers with some very important differences. The major differences are seen in the components of the system and the refrigerant used in the cycle. 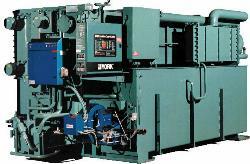 Absorption systems use what is called a “thermal compressor” in place of the conventional system’s compressor. Additionally, absorption systems use distilled water and either nontoxic lithium bromide or ammonia, thereby eliminating harmful chlorofluorocarbons (CFCs) common to mechanical systems. Currently available water-cooled absorption systems use water as the refrigerant and a lithium bromide solution as the absorbent material. Air-cooled systems use ammonia as the refrigerant and water as the absorbent. Other significant differences include the use of heat, rather than a compressor, as the driving force, and lower pressure/vacuum conditions. Heat for the absorption process can be supplied directly by a gas burner or indirectly from the recovered waste heat of a cogeneration system, hot water or steam. The number of heat exchangers distinguishes the system as either single-effect or double-effect and serves to improve efficiency and lower operating costs. Indirect-fired single-effect absorption systems attain coefficients of performance (COP) of 0.60 to 0.70 while comparable double-effect systems can achieve a COP of 1.20. Three types of double-effect absorption chillers are commercially available and all offer comparable performance. The three types, series-flow cycle, parallel-flow cycle and reverse-flow cycle, are differentiated by the path that the absorbent/refrigerant solution flows to the primary and secondary generators.